Sources with knowledge of what was found on Sept. 21 said there are more than 20 carved wooden images, standing between 3- and 4-feet tall. The carved wooden images were described as being in various stages of completion, with some expertly finished. Two upright carved stones were also discovered, according to the sources, who all spoke on condition of anonymity. No human remains were found inside the lava tube, according to a Sept. 27 letter from Melanie Chinen, administrator for the state Historic Preservation Division, to Dennis Frost of Rutter Development Corp. of Irvine, Calif. It is unclear whether the images are ki'i, or carved images that were made as personal gods. Sources said the objects date back to the 1800s and might have been carved in the 1840s, about 20 years after Chiefess Kaahumanu outlawed the Hawaiian religion and the practice of using ki'i. For several weeks, the state Historic Preservation Division, Rutter and landowner Kennedy-Wilson International have tried to keep the discovery confidential, partly because they want the site secured from looters. They have each declined to answer repeated Star-Bulletin inquiries about the find at "The Shores at Kohanaiki," which is several miles north of Kailua-Kona. The 450-acre property is the future site of a championship golf course and about 500 luxury homes. Community groups long fought the development and finally relented, in part, when Rutter agreed to provide a 128-acre public coastal park with 120 parking stalls and a beach facility with snack bar, restrooms and showers. Paul Rosendahl, an archaeologist hired by Rutter, told the Star-Bulletin last week that the lava tube has been resealed and 24-hour security is in place. All construction work was stopped in the immediate area when the find was made and has not resumed. Rosendahl said that in deference to families with ties to the site he would not comment on what was found. "We are following the administrative rules for dealing with an inadvertent discovery like this and are consulting with members of the appropriate ethnic groups." Referring to families and kupuna with ties to the site, Rosendahl said, "I put their concerns before anyone else's." Rutter notified the Historic Preservation Division when it found the images and state staff inspected the site. But since no human remains were found along with the images, Rosendahl said the developer, under his interpretation of state law, has the right to determine the disposition of the artifacts. Rosendahl said they are consulting with kupuna who have ties to Kohanaiki to further identify the images and collect information needed in deciding their fate. He is also working with MaryAnne Maigret, the Hawaii Island archaeologist for the Historic Preservation Division. In an Oct. 10 letter to Chinen, Rosendahl referred to state law and wrote that Rutter "as the owner of a historic property located on private property and lacking in any human skeletal remains asserts its right to assume the leading role in determining the appropriate protection, treatment and ultimate disposition of the site and its contents." In the same letter, he challenged Chinen, saying that contrary to her Sept. 27 letter, the Historic Preservation Division "does not have any authority to make unilateral decisions regarding the site." Rosendahl wrote that Rutter "will continue to assert its sole right to control access and determine in consultation with the professional staff" of the Big Island office of Historic Preservation "who will be, and under what conditions, granted access to the site." He also said that Rutter "wishes to maintain a low profile with regard to the site for now as the best protection for the site." Van Horn Diamond, former chairman of the Oahu Island Burial Council, said, "This is the way the law is written. I don't think that the developer is trying to deny the Hawaiian community participation in this." "I hope they make the right overtures to get cultural input from Hawaiians and they can do that by finding the lineal descendants" with ties to the site, Diamond said. The finding has been whispered about on the Big Island for weeks. Herb Kane, an artist and historian who lives on the Big Island, was intrigued that so many carvings were found in one place. He offered two possible reasons that the carvings were found in a group without human remains. First, he said that after Kaahumanu outlawed the Hawaiian religion in about 1819, some families hid their ki'i in caves to safeguard them from being destroyed by gangs "who made bonfires of ki'i." 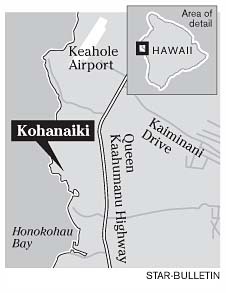 He said the site could be where several families or even a village hid their ki'i. He said if the images have a worn patina from being handled, that would suggest they were someone's ki'i. Another theory is that this was a storage area for one or more expert carvers. He said that after 1820 a whole class of trained wood carvers found they had lost their market. However, Kane said, sailing ships from Europe came into port seeking such carved images to fill museums in their home countries and the craftsman, according to a captain's diary at the time, began selling carved images. Kane said lave tube could also have been the simple storage place for several craftsmen.